The new spring and summer designs from General Utility are a mix of retro classic style, commentary and dry humor. The new “Keep Cold” design is an anti global warming t-shirt with kitschy ice type. The “Off Shore” t-shirt is beach scene with seagulls and off shore drilling looming behind. The “Vegan Dog” t-shirt has a hot dog with Vegan spelled in gooey yellow mustard. 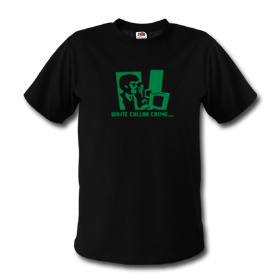 Also, there is a new color version of the best-selling “White Collar Crime” t-shirt. General Utility streetwear is printed on fine quality apparel. Most designs are available on super soft, American Made t-shirts. A variety of cuts and styles are available for both men and women. The goods are printed with ultra lightweight and durable Flex Printing. The web store is easy to use, has secure order processing and fast shipping. Doug Domonkos, a San Francisco artist and graphic designer, opened the General Utility online shop in 2006. Doug started designing and selling t-shirts in 2002 while he was the owner of a San Francisco art gallery, called National Product. Since the beginning, the ironic, subtle and classic designs have attracted many loyal customers. Although there are many t-shirts on the market, Doug saw the need to make a t-shirt line that had an urban edge, but was not over-complicated or trendy. The result is a line of goods that has long-lasting style and looks good – season after season. General Utility will continue to add fresh and new designs, to the product line, every spring and fall. This entry was posted in Apparel, Consumer Goods, Online Retailers, Online Shopping, Retail, Retailer, Shopping, Shops and tagged Apparel, Consumer Goods, Online Retailers, online shop, Online Shopping, Retail, Retailer, Shopping, Shops, streetwear, t-shirt, t-shirts. Bookmark the permalink.